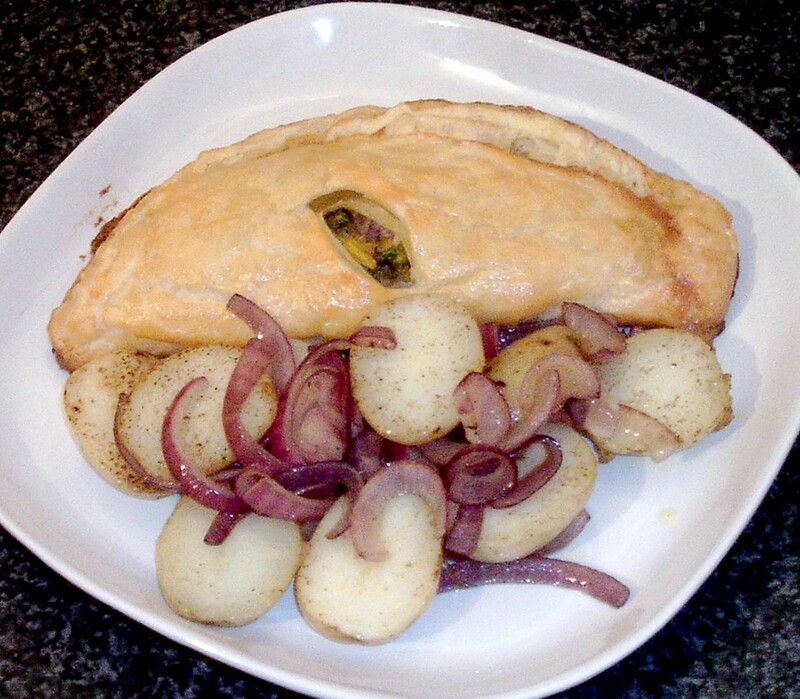 Salmon is almost certainly the type of fish most people would associate with being prepared en croute (in a pastry casing) but it is possible to adapt the concept using a wide variety of different types of fish. 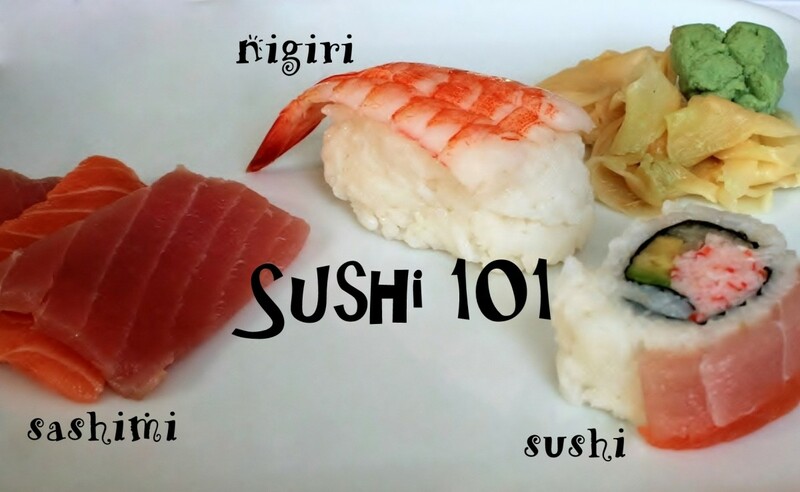 It is also similarly appropriate to devise an accompanying filling suited to not only the type of fish but to the taste of the diners. This simple and sweet mango salsa complemented the sea bass extremely well and helped to bring out its delicate and natural sweetness. 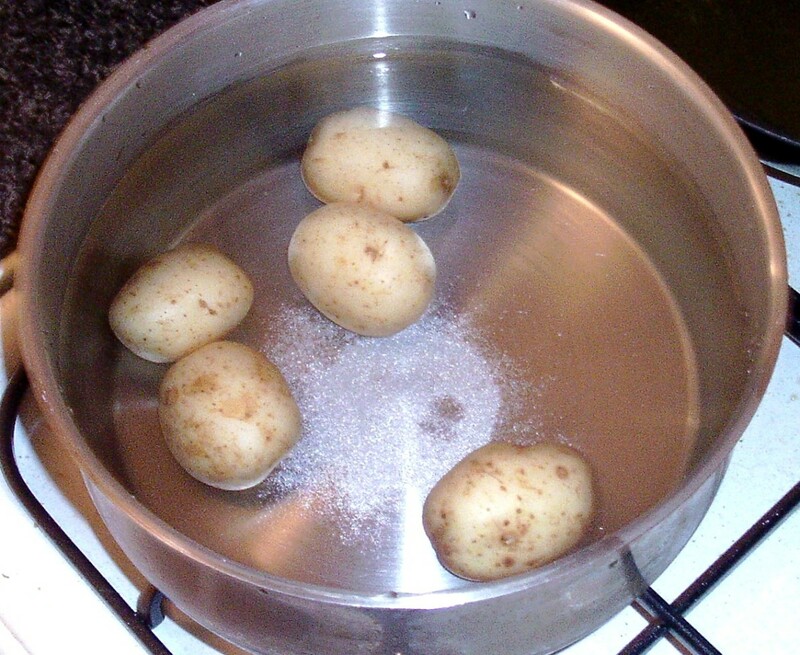 Wash the potatoes and add them to a pot of salted water. Bring the water to a simmer for about twenty-five minutes or until the potatoes are just softened all the way through. They can be tested with a skewer to make this determination. Drain the potatoes and let them steam off and dry out for a few minutes before covering them and leaving them to cool completely. Peel the onion and cut it in half down through the core. 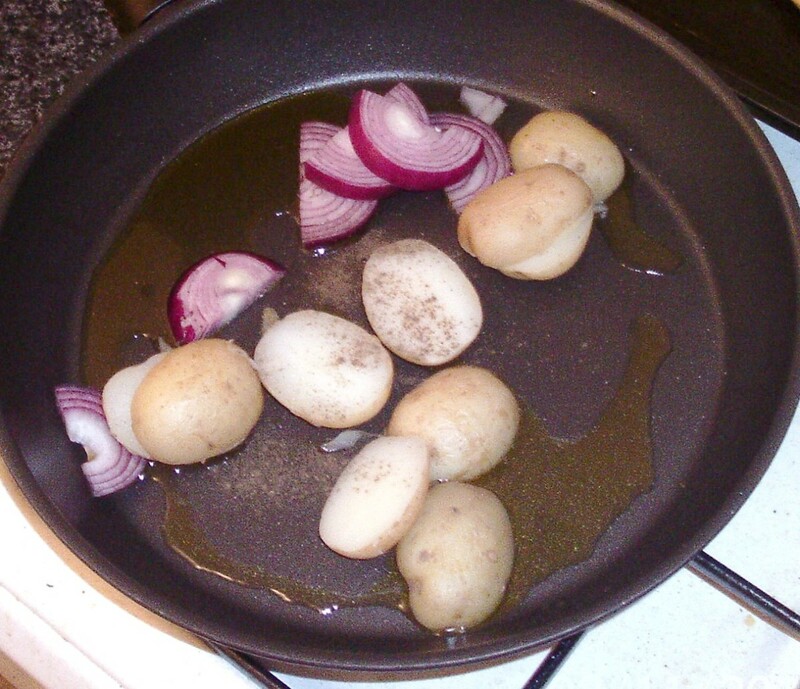 Set one half aside for later stir frying with the potatoes. 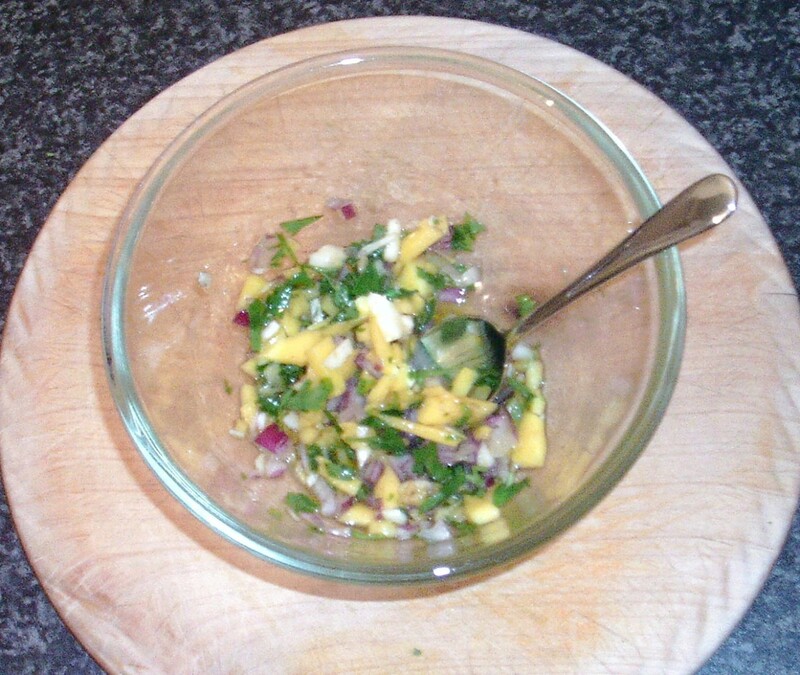 Finely dice the other half and add it to a mixing bowl along with the finely diced peeled mango half. 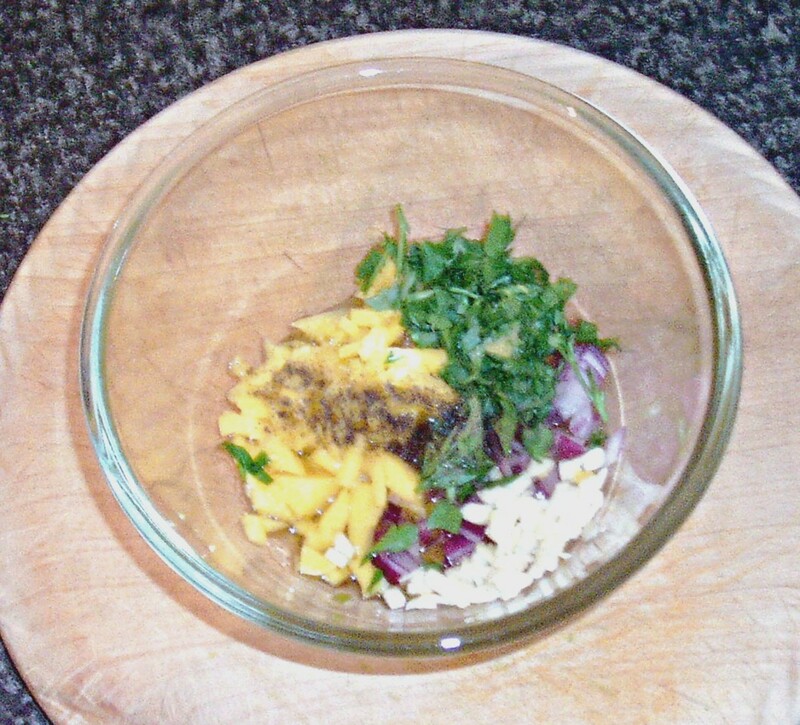 Peel the garlic and grate it in to the bowl before adding a teaspoon of chopped coriander/cilantro and seasoning with some salt and pepper. Stir the salsa ingredients very well together and set the bowl briefly aside. 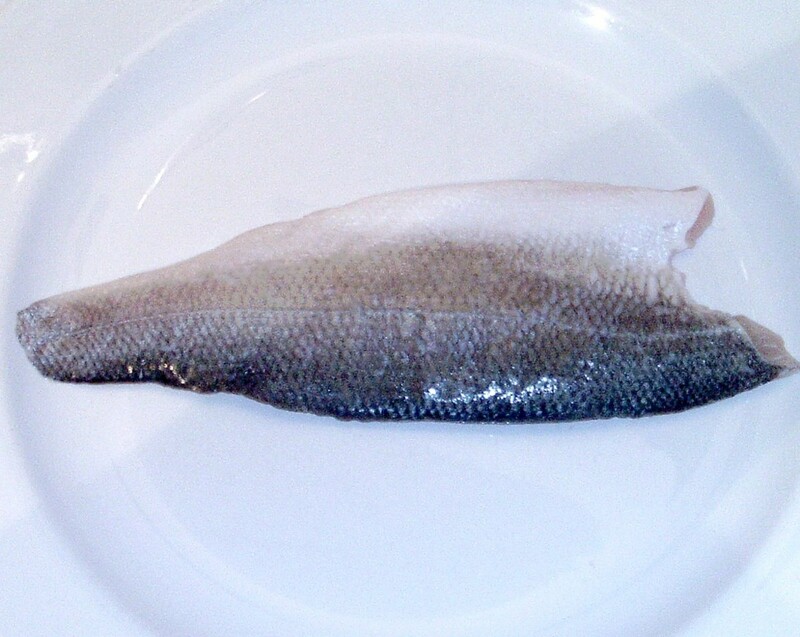 If you are not confident removing the skin from the sea bass fillet, you should ask for it to be done on your behalf at the point of purchase as it is important the fillet not be damaged during the process. It is however a fairly simple procedure. 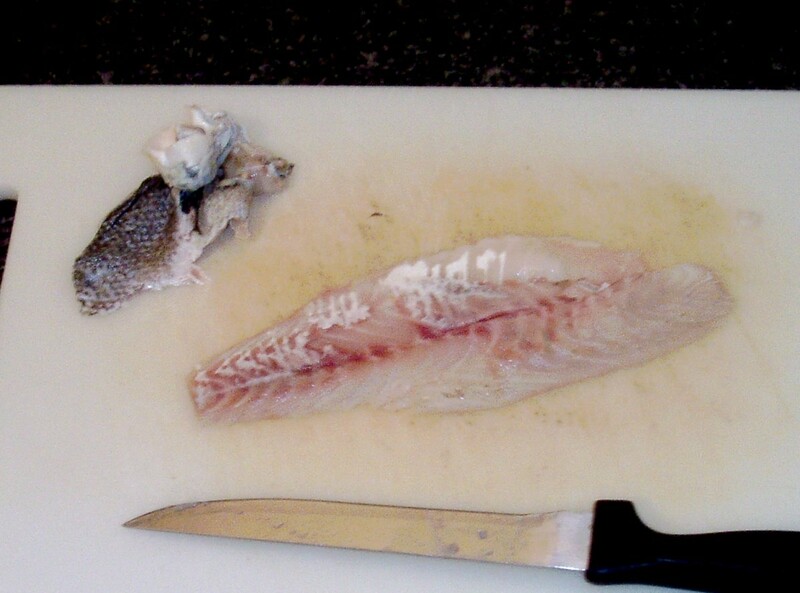 Start by laying the fillet skin side down on a chopping board with the tail (narrow) end nearest to your weaker hand. 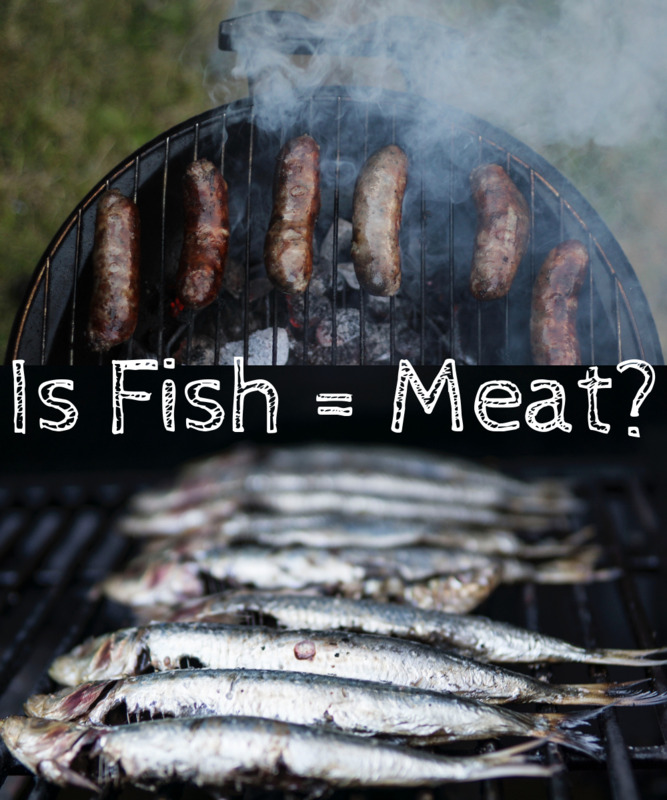 Pinch the very end of the fillet with your weaker hand and slide a filleting knife in to the fish as close as you can to your fingers but facing away in the opposite direction. Go down to the skin but not through it before turning the knife virtually to the horizontal and pull the fillet gently but firmly away from the knife as you move the knife backwards and forwards at a ninety degree angle to the fillet. The flesh should come easily and cleanly free. 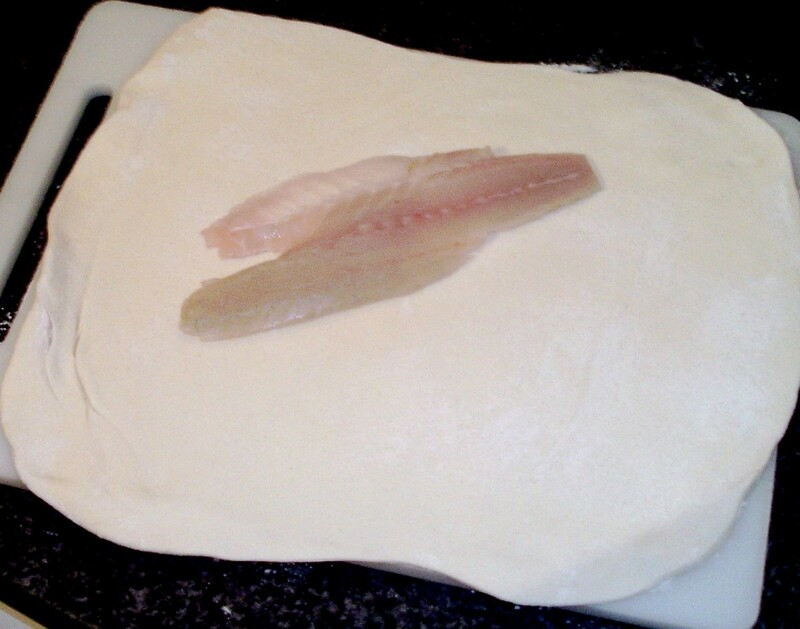 Roll the pastry out on a clean, dry, lightly floured surface to an approximate rectangle, large enough that the sea bass fillet can sit on a diagonally split half with at least an inch spare all around. 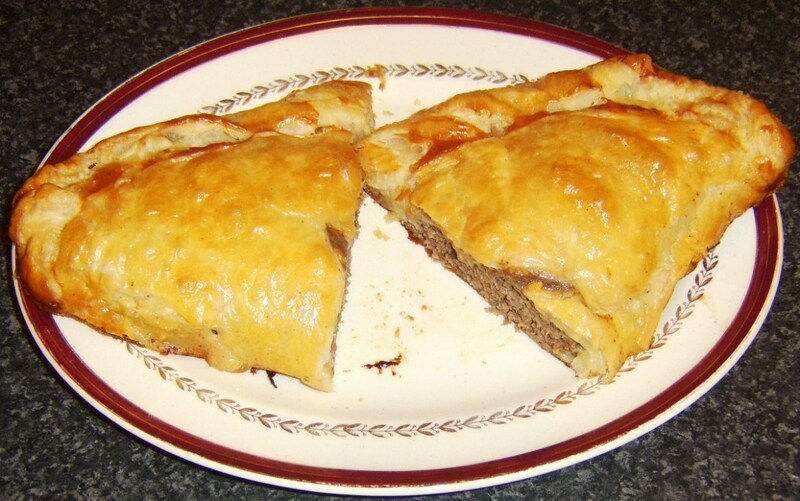 Lay the fillet on one triangular half as shown in the above image. 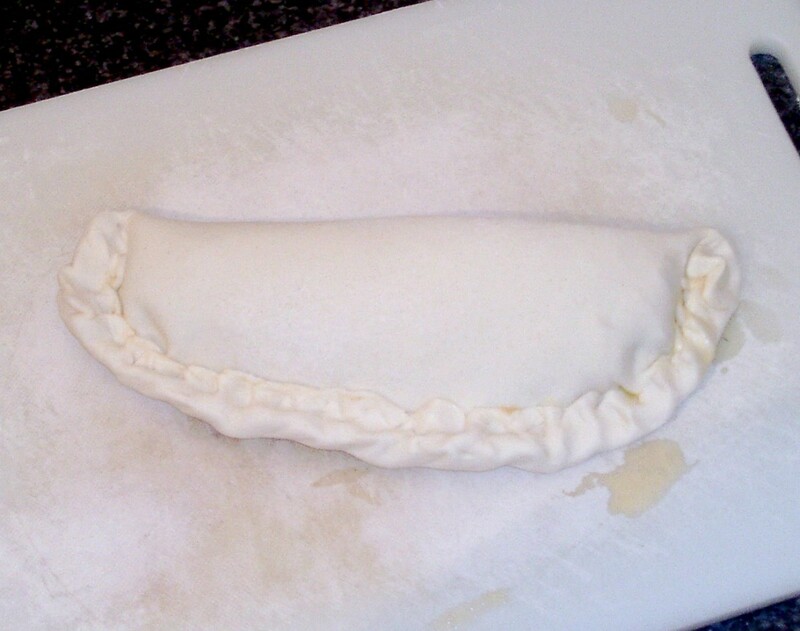 Carefully trim the pastry to leave about a one inch border around the fillet on three sides and to a very slightly larger image in the case of the opposite half of the pastry. 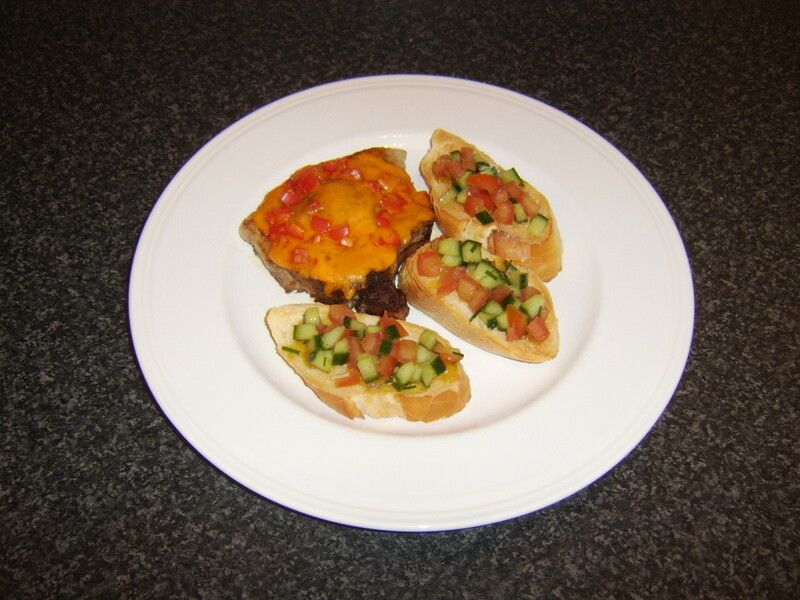 Spoon the salsa on to the fillet but don't overdo it. You may not need all the salsa. 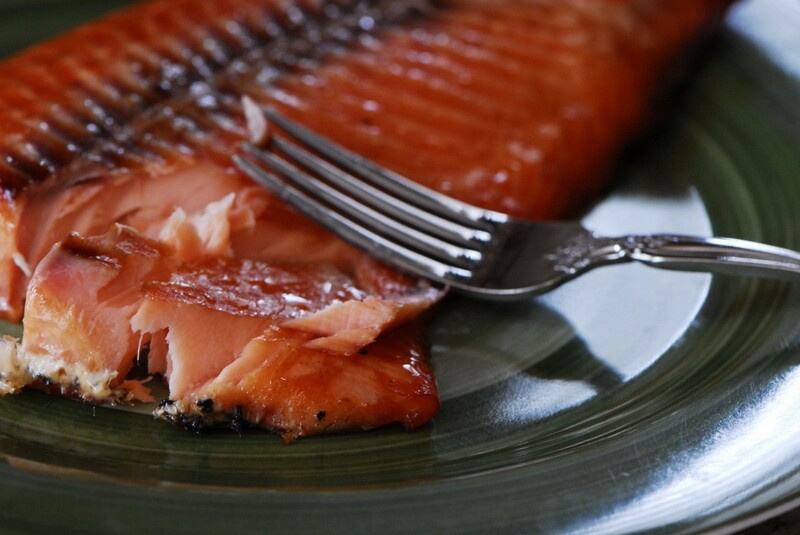 Break the egg in to a small cup or bowl and lightly beat before egg washing the border around the fish. 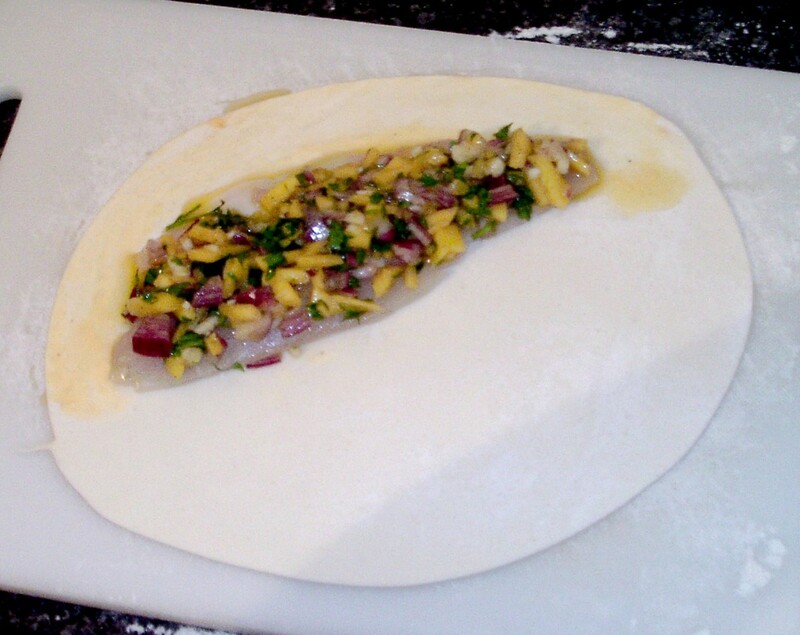 Carefully fold the empty half of the pastry over the top of the sea bass and salsa and crimp around the edges to seal. 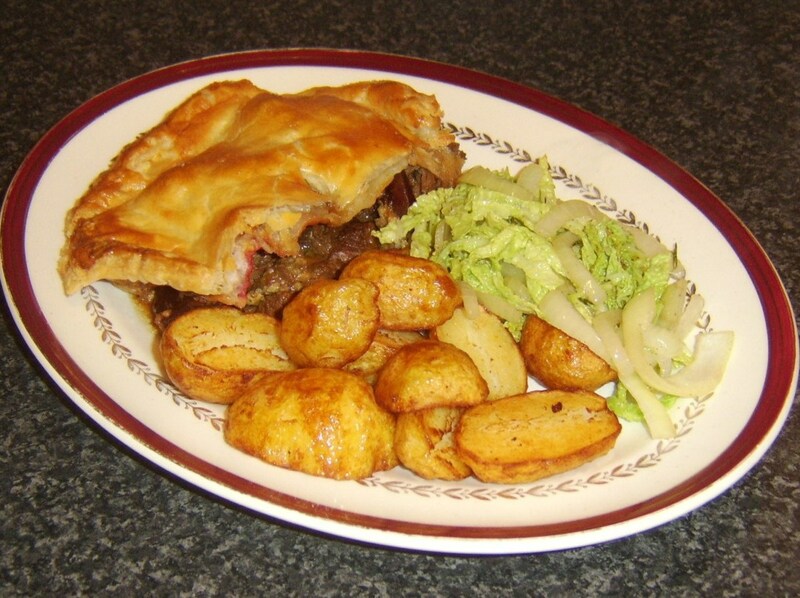 Leave to rest while your oven preheats to 210C/425F/Gas Mark 7. Lightly oil a baking tray and sit the assembly on it. Glaze all over with more beaten egg and cut a one inch steam vent on the top with a very sharp knife. 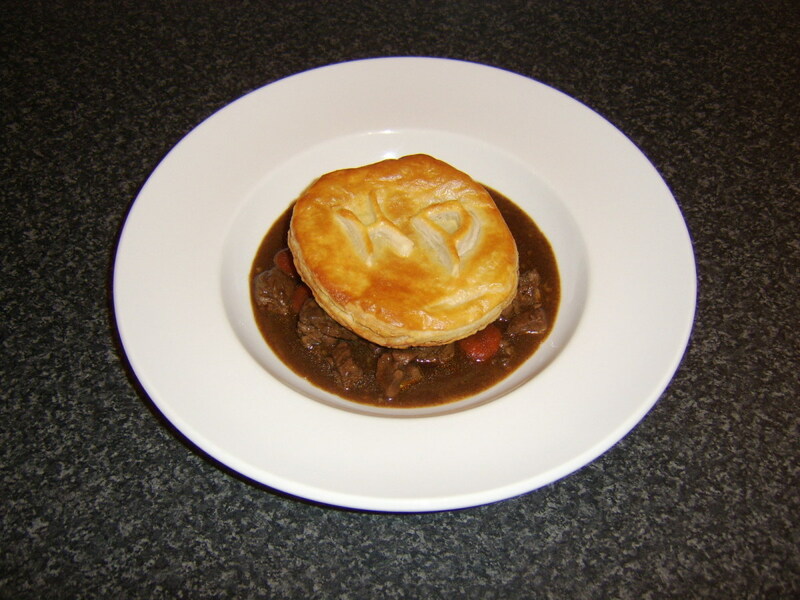 Put the tray in to the hot oven for about twenty minutes or until the pastry is risen and golden. When the sea bass comes out of the oven, sit it aside for a few minutes to rest while you attend to the accompaniment. 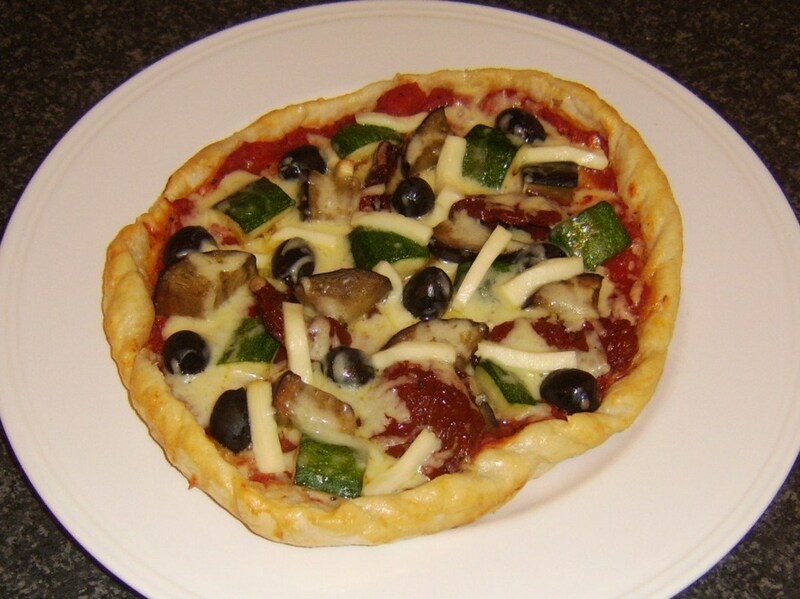 Pour a couple of tablespoons of vegetable oil in to a non-stick frying pan and bring it up to a medium heat. 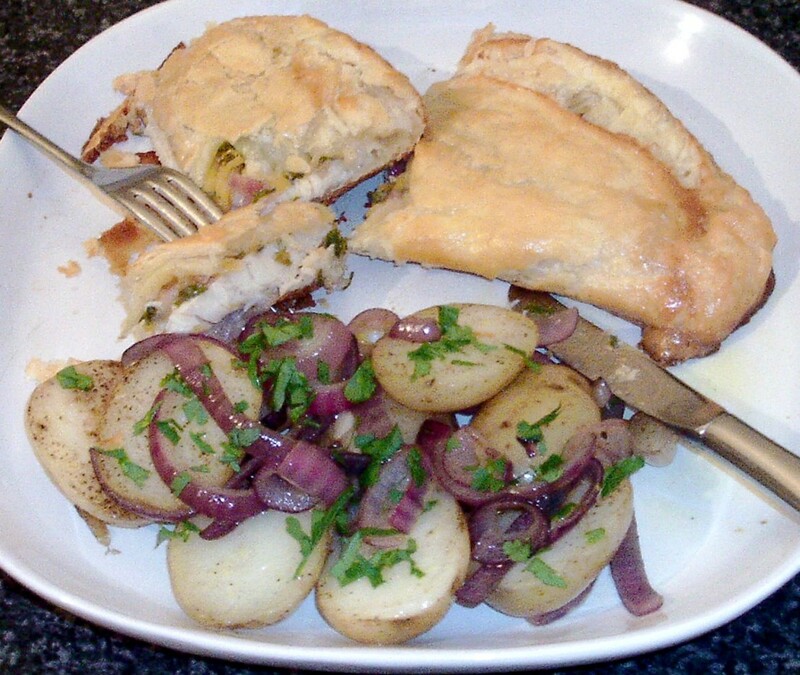 Cut the potatoes in half and slice the onion moderately thinly across the way that each slice can then separate in to strands. Add everything to the hot pan and season with salt and pepper. 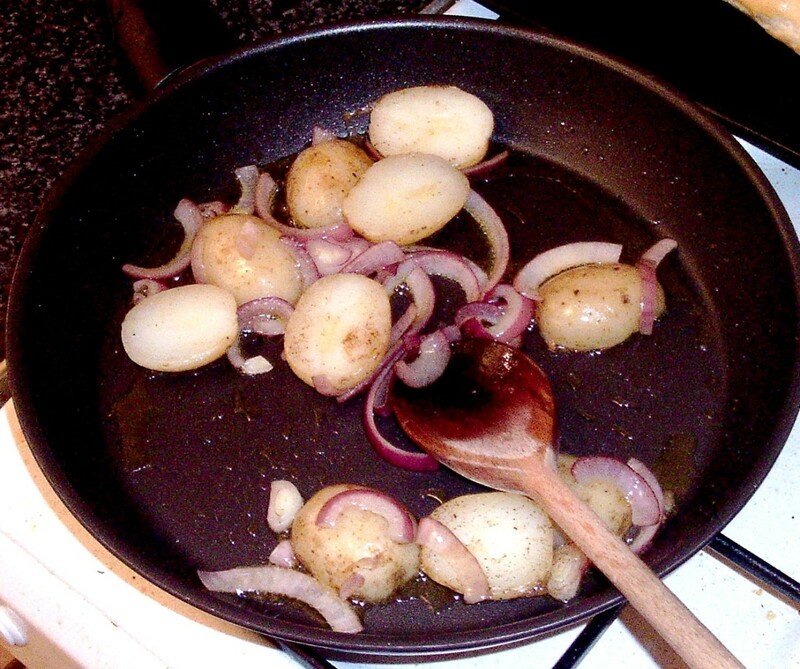 Turn the heat up under the pan and stir fry for a couple of minutes until the onion strands are softening and the potatoes are warmed through. 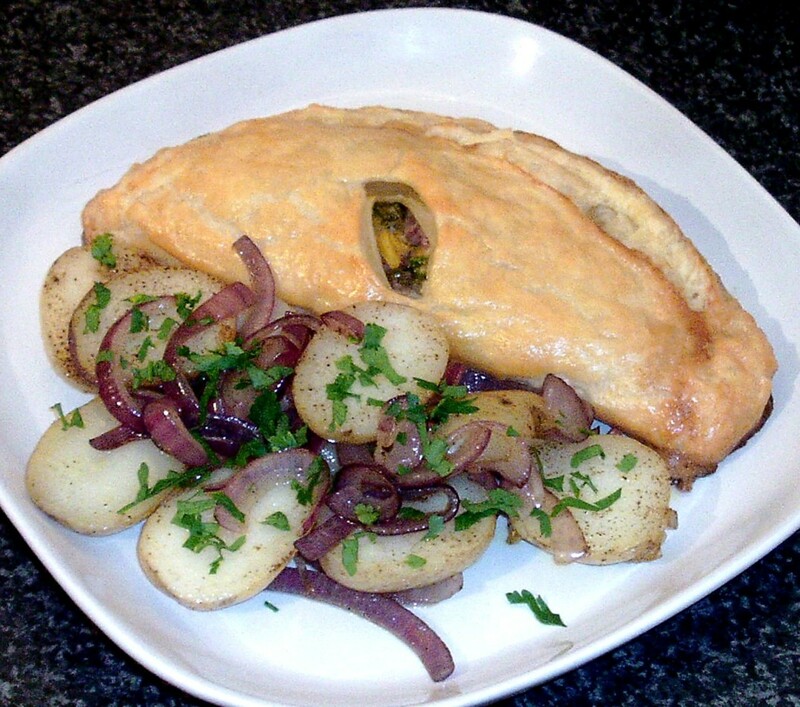 Lift the sea bass on to one half of a square serving plate and arrange the potatoes and onion on the other half. 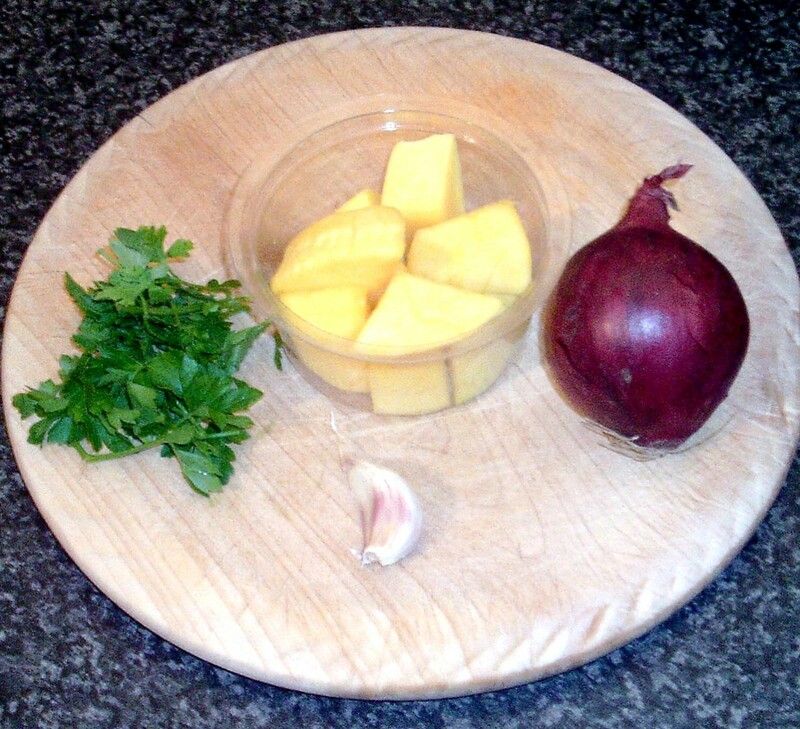 Garnish the potatoes with the remaining fresh coriander before serving. Hello Vicki and thank you. I am envious of you having such ready access to bass. I hope you enjoy your meal!